People repeatedly cautioned us that a couple of days in Venice would be more than sufficient. We spent five days in Venice and left wishing we had more. To walk in Venice is truly enjoyable. What a contrast to the cities we had been visiting along our route through Italy. In Napoli, every step you take – whether crossing a street or walking along a sidewalk – carries with it a sense of possible doom. It could be a collision with a scooter, an overly aggressive taxi cab driver, or just a step into a freshly delivered pile of recycled dog food. There is no strolling in Napoli. In Rome, the scene is grand, and so are the crowds. In Florence it was the assault by the street vendors along with more scooters. In Lucca, beautiful narrow cobbled streets full of shops are shared with cars and no sidewalks. None of these distractions loom in Venice. There are no cars, no bicycles, and, best of all, NO SCOOTERS! You can walk out of your door without looking both ways. You can cross any intersection or bridge without fear of collision. You can stroll and enjoy the magnificent scenes that abound in every direction. It was really striking how much we noticed this lack of competition for our senses. There is a calm and sense of tranquility this creates that needs to be experienced to be understood. If you have seen the movie Big Fish , there is a scene where the main character comes across a town in the woods named Spreckels. The town has streets paved with grass, no exit route, and nobody wears shoes. The once famous poet that resides there has lost his entire muse upon his arrival to the town, since all of his desires had been satisfied beyond his own imagination. Venice could easily be the Spreckels of travel destinations in Italy. A highlight of our whole trip thus far was the Venetian Opera we attended at La Fenice (The Phoenix). This is a magnificent theatre that has burned down and been rebuilt three times over its lifetime (hence the appropriate name), but still maintains its original 500 year old design and charisma. There were a total of 1,000 seats in a very compact and traditional design consisting of the floor gallery seating at stage level and surrounded by vertical seating in boxes of four people rising to the high ceiling. We splurged and sat in the Royal Box about mid-way up the wall directly centered to the stage. In front of the stage sat a full orchestra. The show was Mozart’s La Clemenza de Tito (the Clemency of Titus). The whole performance was magnificent. It was nearly three hours long and I was disappointed that it ended so soon. A day earlier, we had spent considerable time trying to convince Edie that she would enjoy an opera. Such persuasion will not be necessary again. She has already asked about other operas. Our last day in Venice saw a high tide and lots of rain. The flood sirens rang through the city early in the morning. Portable elevated sidewalks that are stacked near low spots throughout the city were placed in their “usual” locations. As we walked to the train station, the shops adjacent the canal were flushing out the overflow of water from inside their stores. Furniture and wares were stacked systematically in a well-rehearsed dance with nature. Leaving Venice on our way to Genoa, Susie and I both expressed our desire to return again in the near future. It is a city where time has stopped and reality moves aside to let your senses soak in this magnificent homage to man’s ability to create beauty and art. This entry was posted in Culture, Italy. First, an explanation of our swift exit from Spain to Italy and a quick lesson on something called the Schengen Zone. When we had planned this trip, we learned that about 10-15 years ago, the EU established a zone within most of the EU countries in which EU citizens could travel freely between borders without going through customs. As most of you know, border crossing is a lengthy process of questioning and passport review. 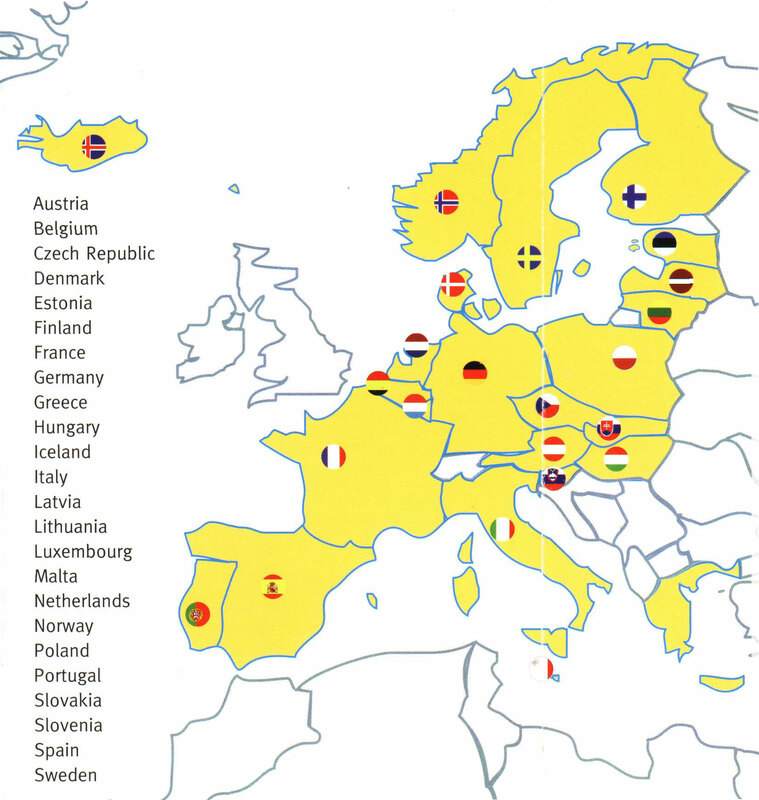 This Schengen agreement eliminated all of that by making border crossings within zones no different than traveling state to state in the US. The downside of this new agreement for Americans is that we are only allowed three months within that zone for travel without requesting a long-term stay visa. I looked into this process, and discovered that the countries wouldn’t grant us one unless we had an address and or itinerary to present, neither of which I had. I learned from France that they would let us stay an additional 3 months after the Schengen allowance was reached, so we understood that we had 6 months of free travel. After 6 months we planned to head up to the UK, which did not join the Schengen Zone, therefore allowing us an additional month before heading home in June. So by January 10th, we were flying from Barcelona to Naples to begin our brisk “Giro de Italia.” We landed in Naples and immediately hopped into a taxi. I was supposed to call our hotel for a taxi, but my phone still had a Spanish SIM card, so we just took the first taxi we saw. Big mistake! The hotel said the taxi would be a fixed price of €16. We are in the taxi with this loud and overly friendly Italian who spoke very good English to us. I immediately became suspicious when I noticed there was no meter on the dash… We realize later, once we learned the town that he drove us all around town, then dropped us at our hotel to the price of €38! Argh… It could have been worse; we have heard stories of people slyly reaching into bags and stealing phones, wallets, etc. In any case, we had arrived in Italy, and if anyone has ever been in Italy, you know it is a beautiful country with amazing cities. We were a bit shocked when we dropped our bags in our very nice hotel, and went to explore the streets. Naples is a gritty, gritty city. The few trash cans we saw were overflowing, and there was trash everywhere in the streets. The buildings were dirty and many of them were crumbling. People drive like maniacs and stoplights are merely suggestions. Motorscooters rule the roads, and if you hear one coming (how could you not? They are extremely loud), you had better look out. They consider pedestrians flags on a slalom course! The people of Naples stay up late… or maybe they just don’t go to bed at night. Their voices and music (live and recorded) get louder as the night goes on. Remember that we had just come from two weeks in some small, quiet villages of Spain. 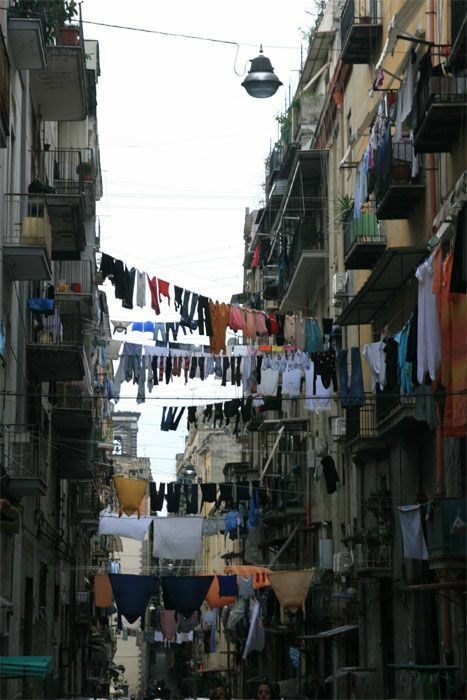 This crazy, dirty, loud, and busy city of Naples was quite a shock! Now, don’t start thinking that I am Nelly Negative about Naples… There certainly is a silver lining for this city; namely Pizza! Pizza with crust so thin and delicate, slightly charred in places from cooking it in the depths of the wood fired clay oven, pomodoro sauce so fresh and bright red, medallions of fresh mozzarella, and perfect basil floating over the top. After two months of ham hocks hanging in our faces wherever we went, we were smiling from ear to ear with this Napoleon delicacy~ and for €3 a pie too! This, we had been dreaming about since we started on this trip. Di Matteo’s wood fired pizza, Yum! Well, we certainly did not fly into Naples just for the pizza (thought not a bad idea, I might suggest to you). 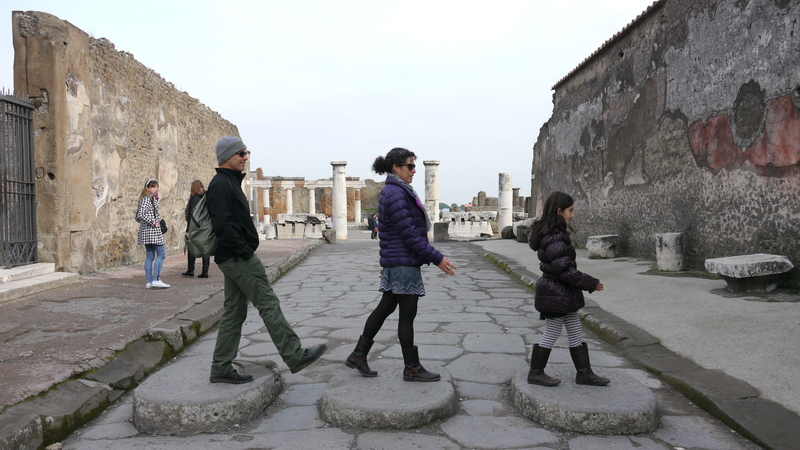 We really came to walk through the streets of Pompeii and Herculaneum (See Eden’s informative essay on the two Roman towns). 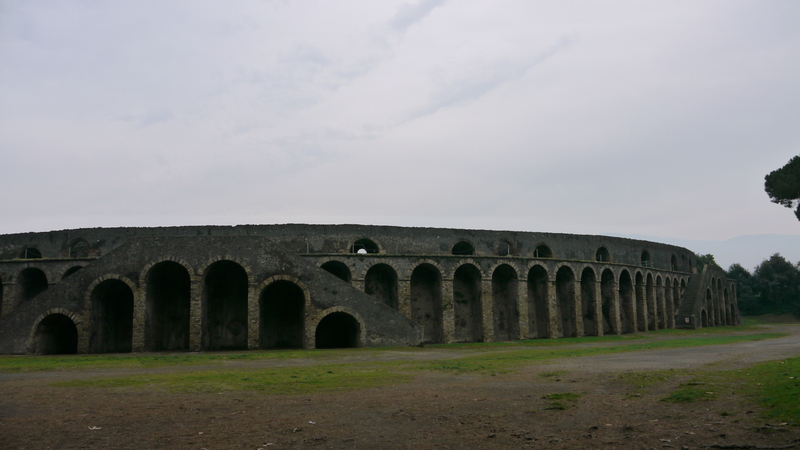 I have been fascinated with the town of Pompeii since I found a library book on the subject when I was just 8 years old. An entire town of 20,000 people was buried in a day with all of its contents (and many of its people). Archeologists have carefully excavated the town and found artwork, utensils, boats, tools, and even scrolls that were preserved due to their burial for 1800 years. Much of the artwork and artifacts that have been discovered are safely housed in the Archeological museum just a few blocks from the hotel we were staying at in Naples. We walked there the first day to get an idea of what was in store for us at the excavation sites. What we saw was absolutely astounding. Mosaic floors with much detail have been carefully sliced out and lifted from their spaces in Pompeii’s grandest houses. They are carefully displayed in the museum for our appreciation along with statues, and frescoes that are amazingly beautiful. 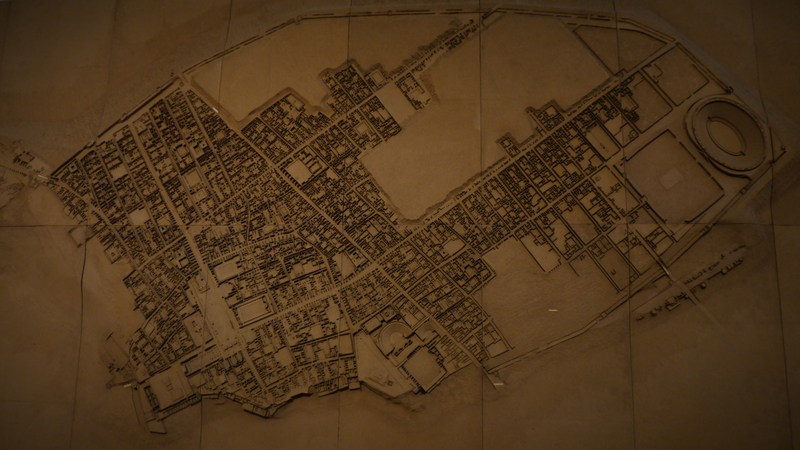 We especially appreciated one room in the museum that had an enormous model of the entire town of Pompeii. We could stand to one side and get perspective of the town in order to orient ourselves for our visit the next day. As Eden says in her essay, Herculaneum was a much smaller town, but was buried with a more voluminous pyroclastic flow. The initial explosion of Mt. Vesuvius was a giant ash cloud and wave of destructive heat. The winds blew the ash to the southwest, burying Pompeii on the first day with this fine gray powder. The second day, the crater collapsed unto itself, and then exploded from the pressure to the northwest, burying Herculaneum under 16 meters of earth. The result of this is a town that is not fully excavated, but is better preserved than Pompeii. 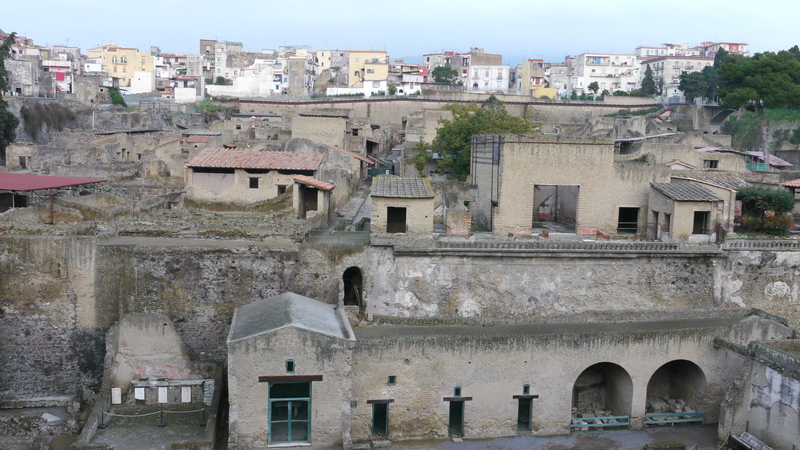 Most of the homes in both towns were two story, but only in Herculaneum can you see most of those homes still intact. Some of the wood trim and doors were buried so quickly they actually burned to charcoal in their exact wooden state. These beams and doors are still there, carefully covered with acrylic so you can see their original form. The town of Herculaneum was much smaller than Pompeii, with narrow streets and pleasant coastal verandas. The excavation site is not coastal anymore, as the volcanic flow added about 400 feet of coastline to the area. There is a row of boathouses that was originally on the waterfront. Sadly, they are filled with skeletons of many of the residents that were trying to hide from the destructive flow that decimated their town. We were able to walk all around the town and in and out of many of the homes. Much of the town has not been excavated due to two major obstacles; 16 meters of earth, and an entire modern town that has been built on top of all of that new surface above. Perhaps someday, we may get to see more of this ancient Roman treasure. The town of Pompeii, on the other hand, is almost completely excavated. This town was not buried under such depth, so its location was always known, with the tops of many of the structures above the earth’s new surface. The excavation of the site began in earnest in the mid-1700’s, and what an accomplishment it is! We walked all through the town as if we were members of the community. The cobbled streets with raised crosswalks are completely intact. The bath houses with coved steam rooms and lockers for clothing are still there. The Forum, or town square, is so grand and well preserved. The tops of the temples are gone, but the columns, pedestals, and steps remain. Many of the homes are open for exploration; we saw palatial courtyards and gardens, as well as street-side taverns with countertops and storage rooms. There is a grand outdoor amphitheater built on a hillside and a colosseum that we were able to enter and sit as if we had tickets to the show. 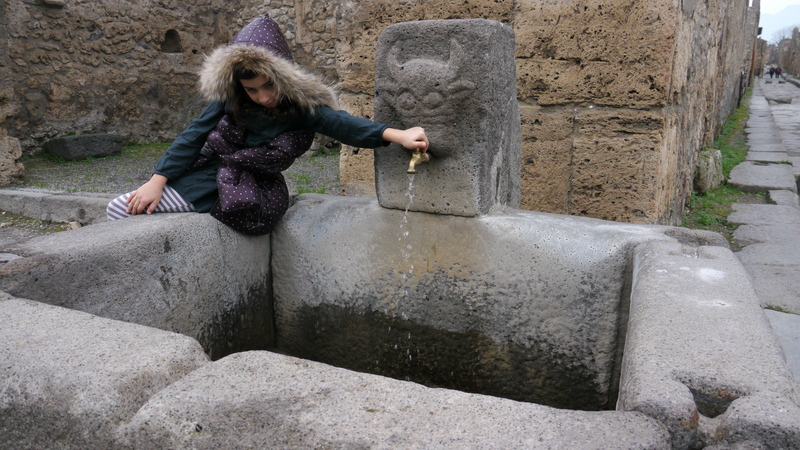 We could see the extensive water system of aqueducts, street gutters, rain cisterns, and public water fountains at almost every corner. We were just blown away by the state of the town, there was so much to see! Isaac took many photos..
After eating pizza every night for three nights, it was time to pack up our bags and catch the high-speed train to Rome. The grandeur (and cleanliness) of Rome was a stark contrast to the gritty streets of Naples. The motor scooters were also much nicer and quieter! Best of all, there was order in the streets, and pedestrians could cross safely at crosswalks. 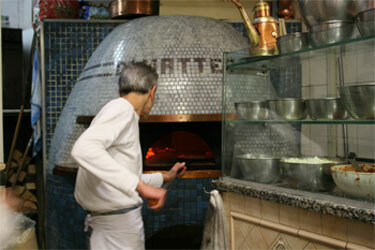 Sadly, we have not found pizza quite like the marvelous creations we ate in Naples! This entry was posted in Italy, Uncategorized. Mount Vesuvius erupted in 79 AD in Italy. This dangerous volcano buried two Roman towns. The names of the towns were Herculaneum and Pompeii. 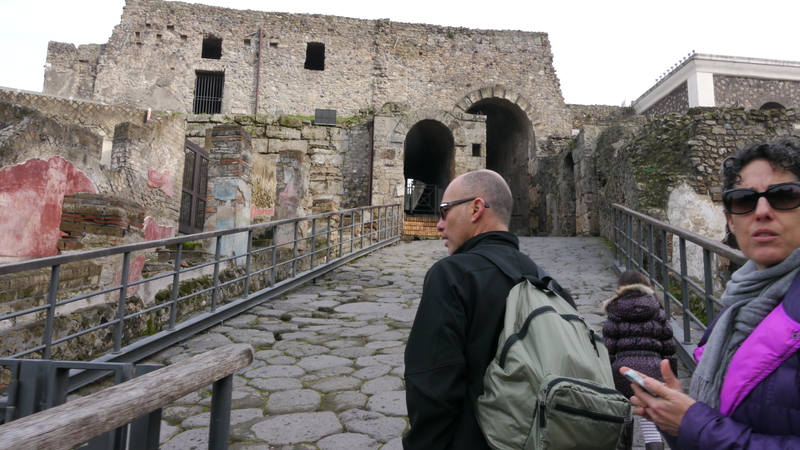 Herculaneum and Pompeii have some differences and some similarities. Here are a few. Both of the towns are coastal towns, and they were both buried by the same volcano. Additionally, they were in the Roman Empire. Here are a few differences of the two towns. 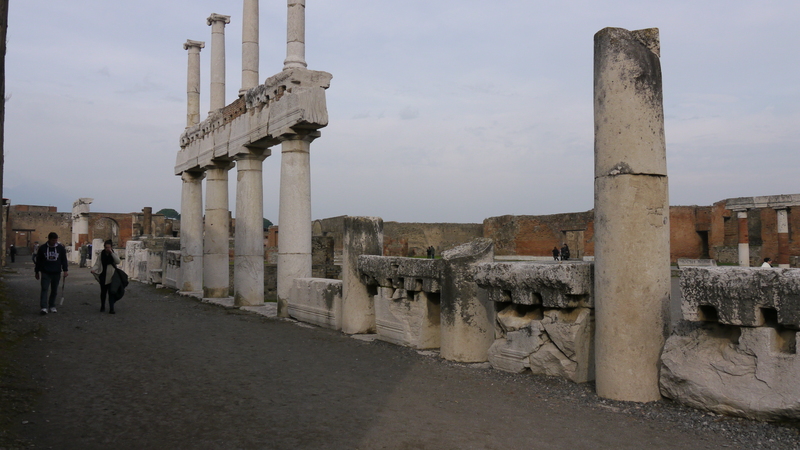 Pompeii is a much bigger city while little Herculaneum stands aside like a little mouse because it is so small. Pompeii had a population of 20,000 people, while Herculaneum had only 4,000. When Vesuvius erupted, it covered Pompeii in hot ash, while Herculaneum was buried the next day by a pyroclastic flow. Archeologists have excavated both towns. What you can see now is all that they have uncovered. Today, anyone can walk through the streets as if the markets were still alive. After Naples, we were a bit worried about Rome and whether or not it would be so gritty… well, it wasn’t. Rome was the grandest city we had ever been to. All of the buildings were wonderfully decorated and regal. The city makes you actually feel like you’re somewhere special. We stayed in a nice apartment with a kitchen so small, it felt like you were in a closet with a sink, a stove, and an oven. After we arrived to Rome in our first speed train (it was super cool, it goes 186 mph), we walked around the city to try and get our bearings. 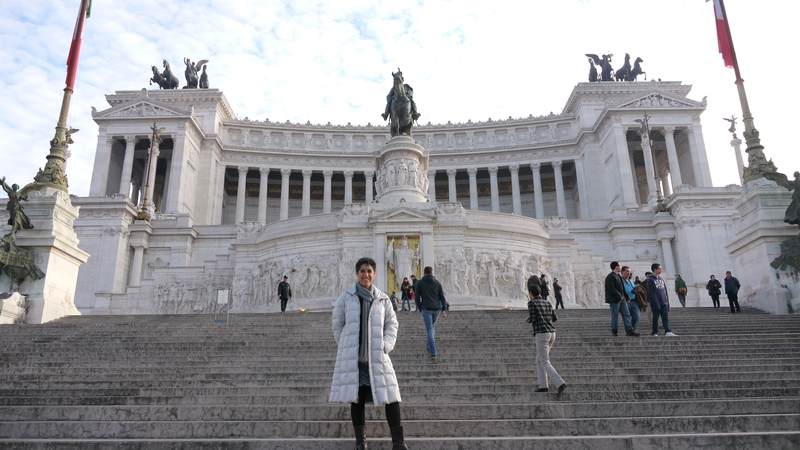 We ended up walking to the front of the ancient forum, and going into the capitoline hill monument. 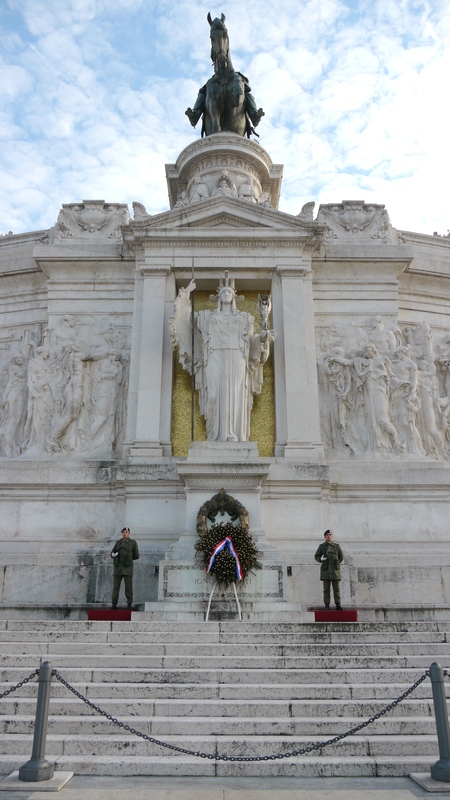 The building was flanked by two soldiers who stand at attention twenty four-seven guarding the tomb of the unknown soldier. On our second day it rained, but that didn’t stop us from getting outside. We visited the Vatican City. We self-toured the papal collection in the Vatican Museum, which was full of beautiful statues and ancient Egyptian mummies. One passage way has a ceiling so lavish with gold, King Midas himself would have been as breath taken as we were. We tunneled around the beautiful courtyards and vast hallways until we finally came to what we were hoping to find; the Sistine Chapel. We entered the room full of tour groups and security officers. Some of the surrounding people were crying from the beauty. We looked up and mom couldn’t answer my history questions. She was speechless. Above us was a ceiling painted with what is considered the most beautiful frescos in all of history. 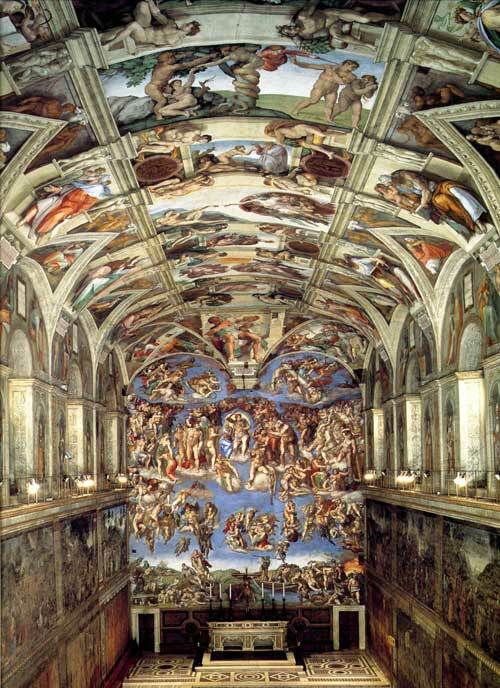 Amazing paintings decorated the chapel, and in the center of the ceiling was The Creation of Adam by Michelangelo. After our visit to the chapel, we exited the building and headed into the magnificent St. Peters Square and into St. Peters Basilica. 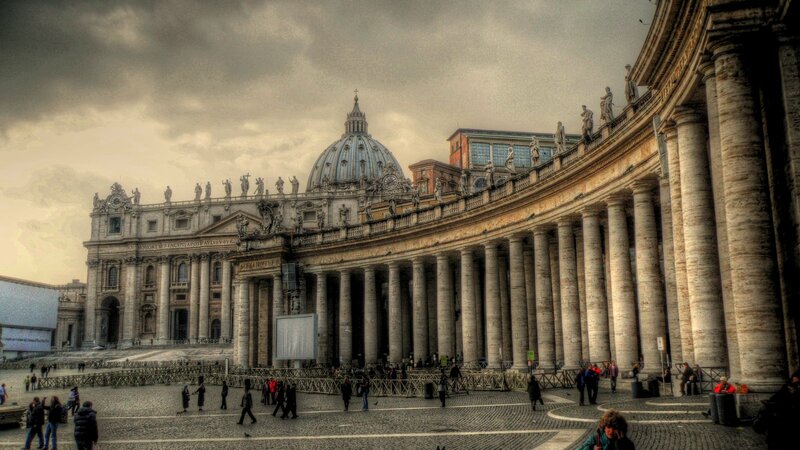 Michelangelo’s cathedral is definitely one of the grandest and extravagant churches in the world. 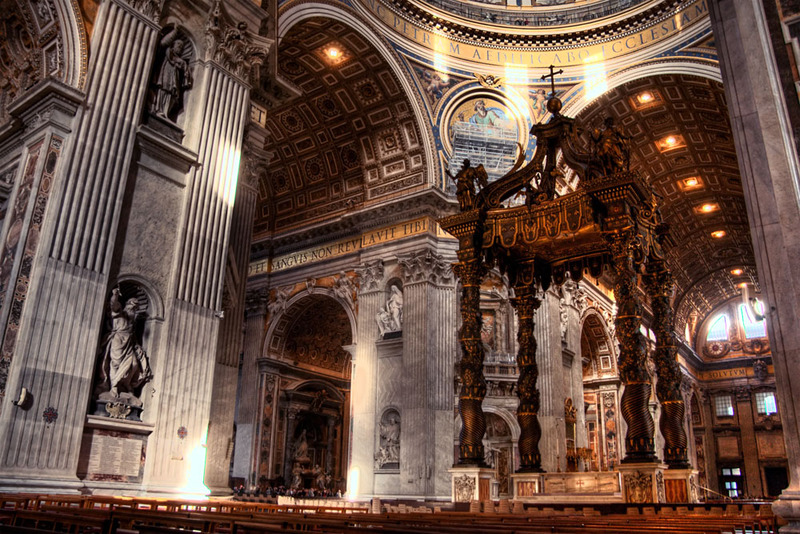 In the center of the basilica is an enormous bronze canopy supported by unique twisting pillars. Underneath the church is a crypt full of the tombs of past popes which is entered by a stairway underneath a statue of St. Peter. On our third and final day in the Roman metropolis, we headed to the Colosseum. The Gladiator stadium was erected in 75 ad and took only eight years to build… but the history of Rome is much different from the history of the Catholic Church, hence the third day in Rome deserves its own post.